Very similar to the Blue Note,just the pot gain and some resistors different,best way to save product cost and design....i guess this was a Wampler's project,maybe slightly refined later. The DC-input protection diode polarity was wrong. The OP-amp output was wrong labeled. Disappointing, nothing more than a sort of timmy without the output OAmp. Thanks for the hint and the strip board layout. Hi, Manfred. Thank you for your nice schematics. I have a question. +VS is connected to the 7th pin of JRC4558 in your schematics. In IvIark's layout, I think +VS is connected to the 8th pin. Sept29 wrote: Hi, Manfred. Thank you for your nice schematics. being a 4558 chip,its gotta be pin 8. Sorry for the issues with the OP-amp pin designations. alexradium wrote: Is this recent? We 'worked' together for a few months about 5 years ago. I came up with the schematic for the afterburner (which became the flexdrive) and had built a proto for a light overdrive that was a super simple build which I guess eventually became the blue note. We (me or Wampler Pedals) no longer have any affiliation, whatsoever, with Rockett now. Any chance to see the PCB layout guys? sorry, I sold the Animal after tracing. Schematic +VR = 470k-470k ,,, oryginal effect- +VR = 47k-47k ????? roberttomasz wrote: Schematic +VR = 470k-470k ,,, oryginal effect- +VR = 47k-47k ????? Thanks for the hint, you are right! 4558 - IN +(3) ,, IN-(2),,OUT (1),, +9V/(8). Dioda 4001 ma być odwrotnie !!!!! roberttomasz wrote: 4558 - IN +(3) ,, IN-(2),,OUT (1),, +9V/(8). Dioda 4001 ma być odwrotnie !!!!! Thanks for the work on this, I built on vero and really love this pedal. 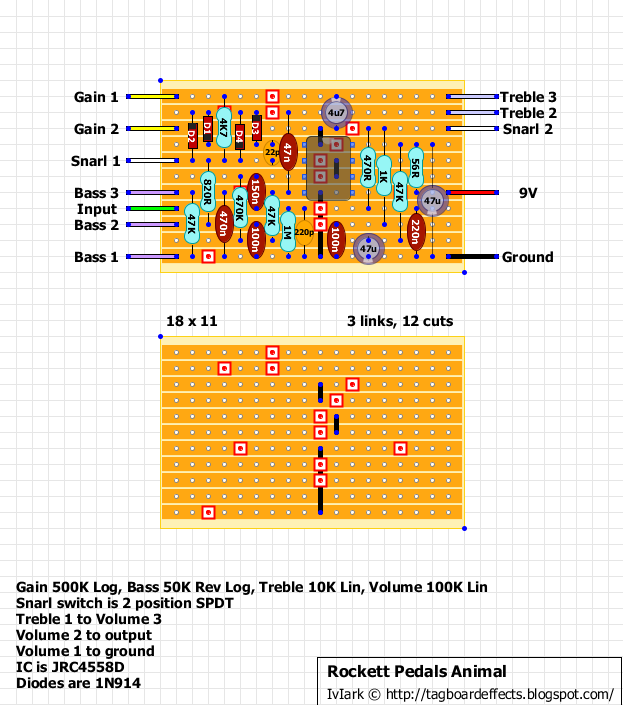 I want to make one with a second stomp instead of a switch for the snarl, I'd also like to be able to increase the volume on the snarl, either a fixed boost or better yet a variable boost set by an internal trim pot. I'm new to this so if anyone could assist with some direction I'd be grateful. either a fixed boost or better yet a variable boost set by an internal trim pot. Should the boost mod works in both snarl settings? Believe the snarl is either engaged for the modded Plexi sound or not for the non-snarl/modded sound, so just want it when snarl is engaged. My best idea so far is to add a simple boost circuit to the snarl side (micro amp, EP boost). Gonna give it a go today. From a technical POV this may be "disappointing" but from a player's POV it's just fine. The Animal, Blue Note and now the Majestic are all very similar but they sound great! For such simple circuits they work exceptionally well. I actually think it's extremely clever to get such cool sounds from so few parts. I'm no electronics guy, just someone who loves guitar and getting great sounds. So for me these circuits are amazing. All three pedals sound good and different enough from each other to justify having each one.